Photograph collection of webmaster. 25299 undergoing testing at Reddish, date unknown. The fifteen year five month career of D7649/25299 included allocations to Eastern Region & London Midland depots. Built: Beyer Peacock Gorton Ltd, Works No.8059. Time between last Classified repair and withdrawal: 77 months. Time between withdrawal & scrapping: 8 months. December 1966 to Barrow Hill (41E). January 1967 to Nottingham Division (D16). April 1967 to Birmingham Division (D02). March 1968 to Longsight (9A). June 1968 to Manchester Division (D09). May 1969 to Nottingham Division (D16). 25299 was the 114th Class 25 withdrawn, one of six retired during October 1981, including sisters 25290 & 25292. 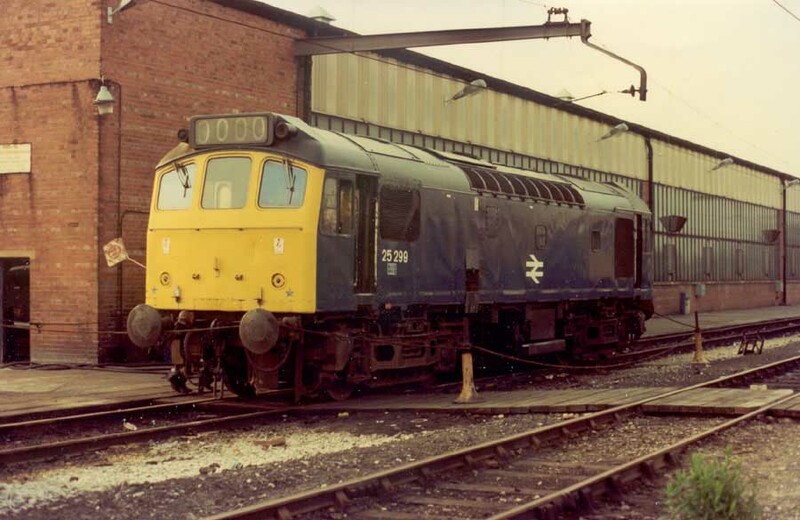 After withdrawal 25299 was stored at Crewe until February 19th 1982 when it was moved to Derby Works and broken up there during the second week of June 1982. Noted Crewe Works January - April 1975. Noted Derby Works September 1979 (N6 repairs). A special Coalville – Littlehampton was noted on the Southern Region behind 7535 & 7649 on April 17th – it’s not recorded whether this train reached its destination still with the Class 25s in charge. On July 26th a roundtrip Nottingham - Morecambe mystery excursion was worked by 7649 & 7524. The 14.30 Blackpool North - Leicester on July 20th was worked to Nottingham by 25299 & 25135. On August 17th 1974 the 07.35 Nottingham - Llandudno Town was worked to Derby by 25299. On July 25th 25299 & 25305 were in charge of a Leamington Spa – Morpeth troop special. A roundtrip Derby - Skegness on June 28th was worked by 25299 & 25018. 25212 & 25299 worked a relief roundtrip Leicester - Skegness on July 5th, using stock brought in from Cricklewood by 46002. Photograph courtesy Dave Homer. 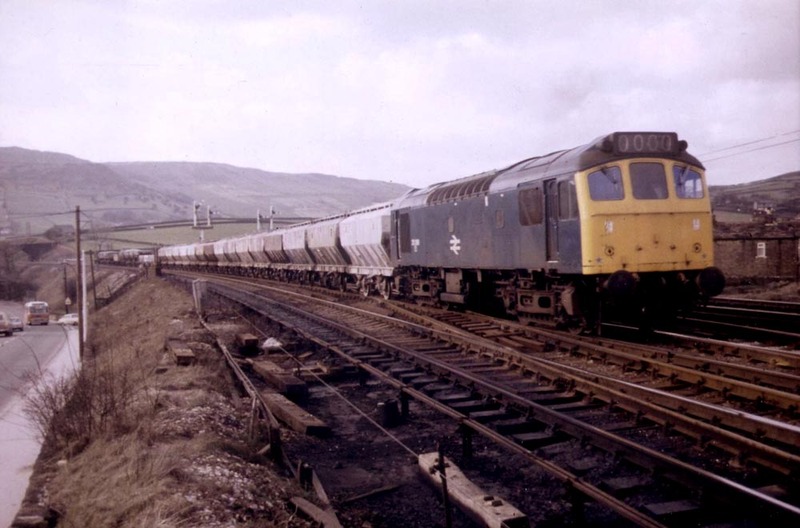 25299 Chinley eastbound. The 16.22 Newcastle - Cardiff on August 18th was worked throughout by 25299 & 25272. The next day the same pair worked the 05.35 Cardiff - Crewe and the 10.00 Crewe - Cardiff. 25299 was stabled at Nuneaton on March 15th. On June 9th 25299 & 25099 worked the 04.15 Shrewsbury - Aberystwyth and the 10.09 Aberystwyth - Euston to Wolverhampton. Photograph courtesy Bernard Mills. 25299 at Manchester Victoria during June 1979. 25299 was noted at Bristol Bath Road depot on December 3rd. On July 10th 1980 the 15.07 Plymouth - Manchester Victoria was worked from Gloucester to Birmingham New Street by 25299 & 25157. 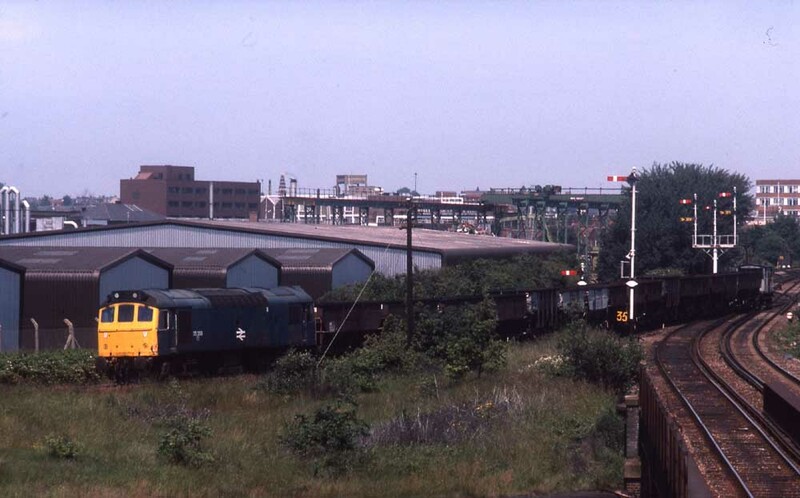 On July 19th 1980 25299 & 25270 worked the 08.02 Walsall - Yarmouth to Norwich, 31243 worked the return leg, since the 18.32 Norwich - Birmingham New Street was noted that evening being hauled by two Class 25s it is presumed these were 25299 & 25270. The 10.10 Euston - Aberystwyth from Birmingham New Street and the 16.10 Aberystwyth - Shrewsbury were worked by 25299 & 25263 on August 9th 1980 and by 25299 & 25242 on September 6th 1980. Photograph courtesy Peter Lovell. Having joined the North London Line at Acton Wells Junction from Brent (behind the guards van) 25299 on the 05:30 Toton East Yard with its motley collection of coal wagons, turns off and heads for Acton East Junction on June 22nd 1981. 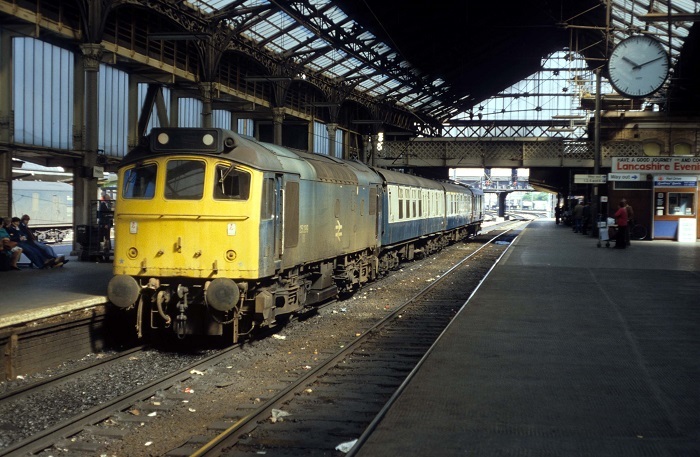 The last recorded passenger working for 25299 took place on August 5th 1981 with the 14.38 Paignton - Leeds being worked by 25299 & 25138 between Gloucester and Birmingham New Street. The Lickey bankers, 37096 & 37303, assisted the service due to problems with 25299. 25299 was withdrawn on October 5th 1981. Page added September 20th 2013. Last updated April 11th 2019.